Give your bathroom a new look and feel with this piece from Delta. This dual-control faucet gives off a modern feel and looks great in any bathroom. Its deck mounted design makes it easy to set up and looks great with many sink types. Save water with this WaterSense certified faucet - designed to help keep you and the environment clean with less water use. Delta's exclusive DIAMOND Seal. Technology uses a valve with a tough diamond coating. InnoFlex. PEX waterways keep water inside the faucet out of contact with potential metal contaminants. This powerful combination brings you a faucet built to last up to five million uses. Classic Centerset (4-inch) 2-Handle Low Arc Bathroom Faucet in Chrome with Lever Handles Give your bathroom a new look and feel with this piece from Delta. This dual-control faucet gives off a modern feel and looks great in any bathroom. Its deck mounted design makes it easy to set up and looks great with many sink types. Save water with this WaterSense certified faucet - designed to help keep you and the environment clean with less water use. Classic Centerset (4-inch) 2-Handle Low Arc Bathroom Faucet in Chrome with Lever Handles is rated 3.7 out of 5 by 10. Rated 1 out of 5 by PrettyKitty from Ordered Delta Classic 4 in. Centerset 2-Handle Bathroom Faucet in... Ordered Delta Classic 4 in. 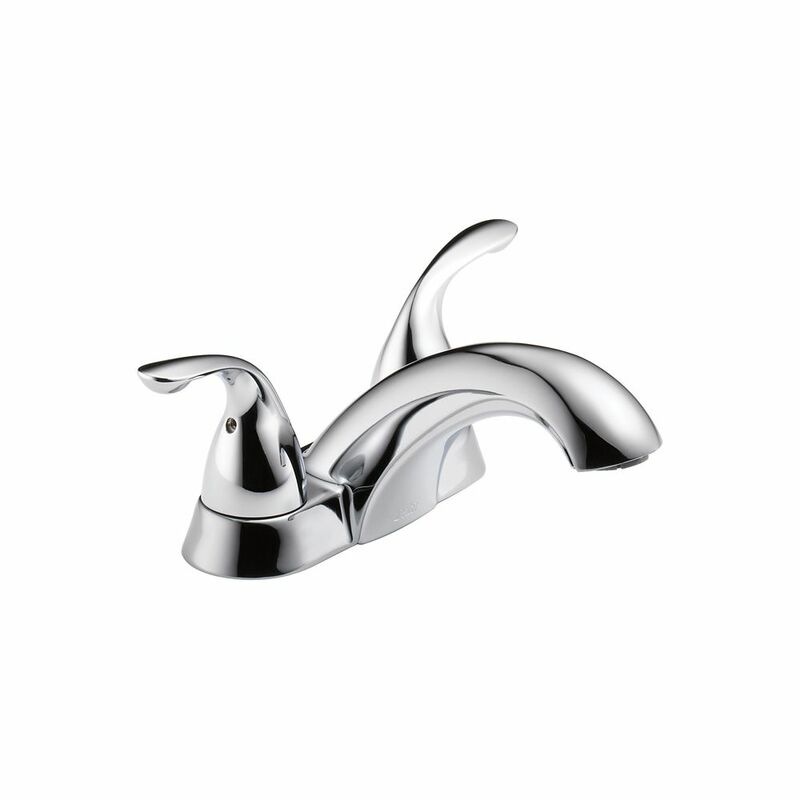 Centerset 2-Handle Bathroom Faucet in Chrome online for home delivery. Faucet arrived broken in the box and had to be returned to the store in order to purchase a different brand/model for installation. Took more time out of my Labor Day holiday. But, very happy with my American Standard faucet that replaced the broken Delta one. Rated 2 out of 5 by Anonymous from Disappointed I didn't realize there was no part to close the drain on the faucet & also no drain parts. This had to be ordered separately. I never saw a faucet like this- I wish it had been explained clearer in the description. I would never have purchased this faucet. Rated 3 out of 5 by Lkp46 from It looked very nice but something I did not notice when I bought it on line was that it doesn't h... It looked very nice but something I did not notice when I bought it on line was that it doesn't have the thing that you pull up and down to open and close the stopper in the sink. I had to return it to Home Depot but bought another Delta faucet that is almost identical. Rated 4 out of 5 by Chris from Simple and Dignified, but hard to match accessories This was acceptable to install with my granite counter tops in the bathrooms. I would have upgraded if I built my condo myself though. It's hard to match accessories because the Classic Collection has so many variants. I want some matching fixtures like a grab bar, a towel bar, a towel rack (aka "train rack"), a tissue holder, and a toilet handle. It's hard to find a simple match online without going into the store. I've gone to other sites like faucet.com, builder.com, and deltafaucet.com to try to cross-reference. Other Delta collections have accessories with a style that undoubtedly matches the sink and shower faucets. But the so-called Classic "Collection" doesn't seem so well put-together. If anything, I feel that the Classic Collection should be backwards-compatible to the other collections. The Classic items should work well with themselves and with the other collections. I found a towel rack ("train rack") and a grab bar that looks simple enough and coordinates okay. I guess I have to burn some gasoline and go even longer with an unfinished bathroom while I drive to the store to see if all of the accessories are there. I just wanted to come to the website, select Delta Classic Collection, and have about 10 or so matching items appear. I wanted to select about 5 of them, put them into the cart, and check out. Then my bathroom would be done. But that didn't happen today. I think it's mostly the manufacturer's fault. Rated 5 out of 5 by hinoki from Super nice faucet!! My old faucet had to go due to an internal leak that flooded the under-sink cabinet. That was such a moldy mess, I really regret not replacing the faucet sooner; it was easy to install. I'm very glad I bought this Delta. I did a ton of research on various brands and models first, and this was the only one that fit my (picky) requirements. Although I paid more than I had at first planned on, the below features are definitely worth the price to me. (Not to mention the peace of mind knowing I'll likely never again grow mushrooms under the sink!) Here are my reasons for liking this faucet: * Quality construction: The only two non-metallic components I could find are a small part under the handles, and the aerator. It's superior to (and far heavier than) the chromed plastic faucet I was replacing. And all of the internal tubing looks to be one-piece, unlike my old one with joints and o-rings that may have failed and caused the leak. * Spout reach: Has one of the longest spouts I've seen--a couple inches longer than my old one. Now I can fit more than my fingertips under the water stream! * Ease of cleaning: The shape of the faucet makes it very easy to wipe down after use. That's especially time-saving if you have hard water like us and try to avoid mineral deposits. My old faucet had lots of nooks and crannies that were frustrating to clean and dry several times a day. * Handle design: Very quick to turn water off and on with minimal motion. Especially convenient when hands are soapy or dirty and I can use a clean part of my hand or wrist to nudge the handle, rather than trying to twist an annoying knob and then having to clean the knob off. Encourages water conservation too--easily turn water off when lathering, back on for rinsing. * Base size: Has a minimal footprint. My sink deck is small, so many faucets are a little too wide or deep. * Valve design: The valve action works well. It opens and closes smoothly with little effort. And it shuts off before the handles are pushed back all the way, so it's almost impossible to accidentally leave it dripping. I was frequently irritated in the morning to find that my old faucet had been wasting hot water all night because the crummy valve didn't close all the way. * Water flow: When turned on all the way, the aerator puts out a forceful water stream if needed for effective rinsing or something. My old one was a trickle by comparison. * Parts availability: Delta provides replacement parts, should any wear occur in the valve asssembly or elsewhere. One minor drawback I've found: * The threaded metal insert that the aerator screws into has some play in it. It may be by design; it's secure and doesn't functionally matter. It's just a bit disconcerting when it still feels loose after tightening the aerator and when it rattles while I'm polishing the faucet. Rated 5 out of 5 by TimHello from Great Faucet I installed this faucet last Friday. This is a great faucet very high quality and I purchased it at a very low price. In my opinion Delta makes by far the best faucets in the lower price ranges. Excellent faucet and very good looking. Also, Delta has the best parts availability. Twenty years from now you will be able to get parts for this faucet. That is very important. You can"t keep a faucet running if you can't get parts. Delta 5 stars!! !